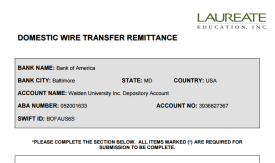 Students wishing to pay their bill using a US-based bank should use the Domestic Wire Transfer Remittance form. This form will provide your bank with the necessary account information for Walden’s bank to facilitate the transfer of funds. International Students should use the Student Finance Portal for Wire Transfer Remittance. 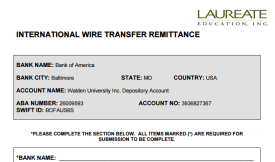 U.S. Students wishing to pay their bill using a non-US bank should use the International Wire Transfer Remittance form. 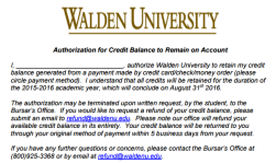 This form will provide your bank with the necessary account information for Walden’s bank to facilitate the transfer of funds. As per the Family Educational Rights and Privacy Act (FERPA) your financial aid records cannot be distributed to third parties without your permission, unless permitted by law. If you wish to provide approval for another person to contact Walden regarding your Financial Aid records, please complete the Release Form and submit it to the Office of Financial Aid. If you have an excess credit on your student account (payments exceed charges), funds are standardly returned to students according to your chosen refund method. If you would like to request that excess funds remain on your account, you must complete the Authorization for Credit Balance to Remain on Account form. If you wish to have excess funds remain on your student account, this form must be completed for each academic year that you are enrolled. This form is not applicable to credits resulting from U.S. Federal Student Aid (Title IV). You are eligible for a Book Advance if you are currently enrolled and your financial aid has been sent to the Lender for the upcoming term. Students who need assistance with the cost of their books may request a maximum Book Advance in the amount of $500.00. Students may begin to submit requests for a Book Advance four weeks prior to the start of their upcoming term. If you have a past due balance or if your financial aid will not cover the cost of tuition for your term, you are not eligible for a Book Advance. If approved, you can expect to have funds sent to you based on your selected refund method within five business days.